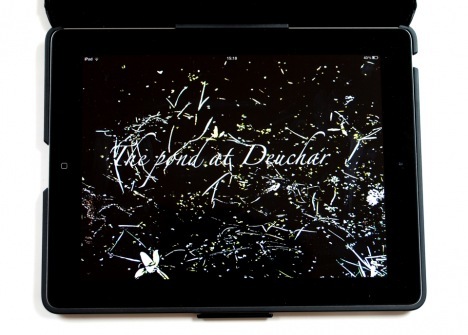 This is an original art publication made for the iPad. 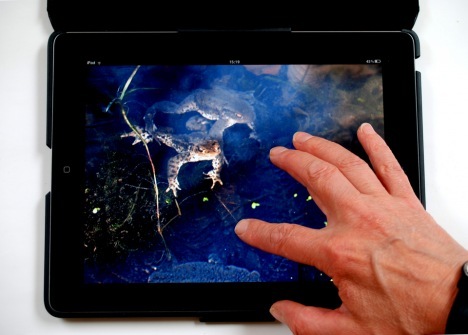 Scroll, glide and plumb the depths of Helen Douglas's The Pond at Deuchar, exploring with your fingers and eyes this long unfolding artwork showing the multitude of life at the fringes of a pond. As you move past frog and toads you encounter arabesques of toad spawn, squiggles of tadpoles and other denizens of the pond. Plants embroider the edge and, intermingling with reflections, weave from below to the surface of the water and screen. All contribute to a dance of light, colour, surface and depth.